This is the only spider with this moveset with an S/S breed with 325 speed and 1400 health. There are two other S/S spiders (Spider and Forest Spiderling), hower they have 341 speed and only 1237 health. Only found 1 in the caves. Just farm any of the pets in the zone and this guy will join the battle including the Cogblade Raptor battles. The only one with 325 speed in the spider family. Read Urticinas comment about how they came up as seconds up with the basilisks. Thought oh well, might as well try, and got a blue spider on first snake I clicked. Walked into the cave, and found an Uncommon at 52 - 85. I found a rare in the western cave in Blade's Edge 9:45pm. It was the only paw there, on the ledge on the right side of the cave. I think that was serendipity. I had hunted the eastern cave the last time I looked for it and found mostly poor & common, with one uncommon. I did find it as a secondary quite a lot in northern Blade's Edge, but no rare for me there, but will agree with Centori, found some other rares I needed when hunting Scalded Basilisk Hatchling in the north. Farming the Scalded Basilisk Hatchling is the absolute way to go here. 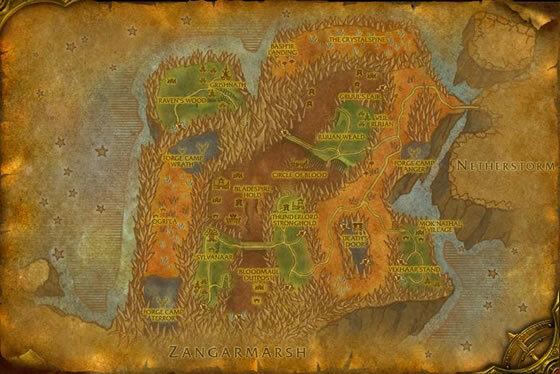 You can get all the pets that come from this zone as secondaries beside the cogblade raptor. While farming I saw 2 of the Basilisks as rares, a squirrel and a rock viper and about 10-15 battles in I got a rare! Also instead of just checking them and moving on I decided to level some pets. Lvl 1 pets will go up to lvl 5 lvl 7 and then 1 lvl a battle from there on out. So it's an awesome way to complete some achievs. The cave only produced a few. Don't fret too much if you are looking for a rare. I might have been (probably was) really lucky. After reading some of these comments I didn't think I would find any. I was just trying to find a green or better rock viper to finish up my outland ach and found two blues as seconds, so they are out there. Both were up by the Basilisk area. Maybe the game was feeling sorry for me with my poor run of mount rolls :). Ha! just tamed a blue one of these which cropped up accompanying a cogblade I was just clearing for pet-xp! xD Nice - thank you universe! I was about to go farm one! Been farming this guy for 6 hours over 2 days. I've seen 13 rare basiliks & countless rare squirrels, rabbits, rock vipers and even 2 rare brown marmots. I've encountered over 100 skittering crawlers & not one rare. I've found them as seconds to every battle pet in every part of the zone, numerous times, and even found around a dozen as primary pets in the tunnels, no rares. Update: posted this, logged in, & first pet (squirrel) I encountered had a rare spider! Haven't seen any in the cave down south yet, but I did just have one come up as an extra pet when fighting a rabbit. Unfortunately it was a poor, they all have been so far. I got 3 rares as adds while trying for the Scalded Basilisk Hatchlings - the only rares of this I ever saw. If nothing else, they seem much more common as adds to the Hatchlings than anything else I tried in the zone. Found lots of these as 2nds to the Cogblade Raptor near Death's Door. Got my rare there. Found mine in the cave between Zangermarsh & Blade's Edge. Snagged myself a rare on the first go-round! About 12:35pm server on Whisperwind. Good luck, y'all! EDIT: Okay, I've seen like 7 of these now and 6 of them were seconds to the Scalded Basilisk Hatchlings. The first 5 of those 7, including the one I captured in the cave, were rares. The 6th was poor and the seventh was Uncommon. I was beginning to think they were ONLY available in rare (ha!). I found this one twice as secondaries. One to a rabbit, the other to a squirrel. So aparently they can potentially come from any battle. Rare farming this pet, found one in the cave as the named battle pet Skittering Cavern Crawler that connects Zangermarsh and Blage's Edge Mountain and two more in the other cave at that does the same thing, but they were only common and below. So I took the advice to kill anything in the zone and I seen they come up as a second to the Rock Vipers, Scalded Basilisk Hatchings,but you will never find one on any Rabbits or Squirrels. But I finally found 3 more in that same cave after doing a run of the zone and finally ended with what I came for. 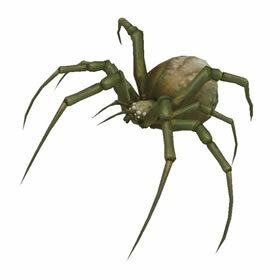 These arachnids use their razor-sharp legs to carve tunnels in the solid rock of the Blade's Edge Mountains.